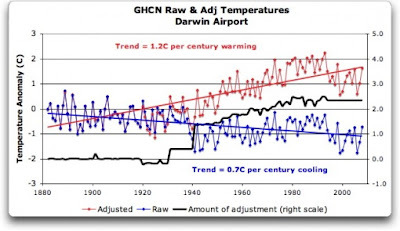 "Before getting homogenized, temperatures in Darwin were falling at 0.7 Celcius per century … but after the homogenization, they were warming at 1.2 Celcius per century. 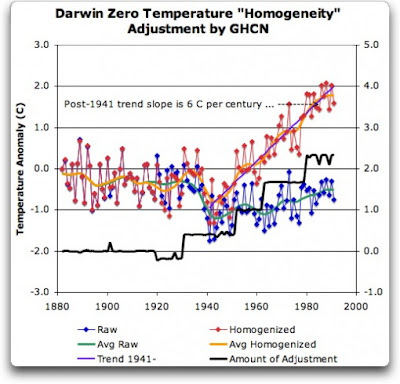 And the adjustment that they made was over two degrees per century … when those guys “adjust”, they don’t mess around. And the adjustment is an odd shape, with the adjustment first going stepwise, then climbing roughly to stop at 2.4C. What on earth justifies that adjustment? How can they do that? We have five different records covering Darwin from 1941 on. They all agree almost exactly. Why adjust them at all? They’ve just added a huge artificial totally imaginary trend to the last half of the raw data! Now it looks like the IPCC diagram in Figure 1, all right … but a six degree per century trend? And in the shape of a regular stepped pyramid climbing to heaven? What’s up with that? Those, dear friends, are the clumsy fingerprints of someone messing with the data Egyptian style … they are indisputable evidence that the “homogenized” data has been changed to fit someone’s preconceptions about whether the earth is warming. One thing is clear from this. People who say that “Climategate was only about scientists behaving badly, but the data is OK” are wrong. At least one part of the data is bad, too. The Smoking Gun for that statement is at Darwin Zero." Note the downward sloping (blue) raw data line, the upward sloping (red) adjusted data line and the adjustment line (black) itself. Any passing warmists care to comment? You imply that if this data is questionable, that renders the entire GW hypothesis questionable. How can this be so, since this is just one set of data, and the GW hypothesis is based on many different datasets collected by different people using different methods? If the number of remaining datasets starts to look a little anemic, then your case will have been proven. Unfortunately, I don't have the time today... if you happen to know of an existing index to GW datasets, that would be very helpful. Without such an index, however, I'm not sure it's reasonable to claim that the majority of the data are questionable. How many datasets are there overall, and how many have been called into question? The cheapest ever Pop Video? Is the UK economy about to collapse? The BBC updating the news? Is having gone to Eton such a bad thing? Where is Abdul Baset Ali al-Megrahi? Is John Bercow running scared of Nigel Farage? And this is good news? Why did nobody challenge Major Hasan? The worst song of 2009? "How To Make The World's Easiest $1 Billion"
Whatever happened to Gordon Brown's "Golden Rule"
Might they have something to hide?